There are many unseen roles in film and television, many people without whom our entertainment could not be made. From costume and set designers to gaffers and caterers, there's a lot going on behind the scenes to create a satisfying viewing experience for audiences. But there's one group of oft-unsung heroes who do step in front of the camera — and if everything goes the way it's supposed to, the audience won't even realize they're there. Stunt doubles don't have to be exact doppelgängers of the actors they're trying to portray, especially with makeup and motion-capture technologies improving all the time. But there have been a few instances when it's been difficult to tell the A-lister from their risk-taking counterpart. In many cases, the major star and their stunt double twin grow close in the process of filming, making it even harder to tell who's who. And looking like an actor isn't all these daring performers have going for them — many stunt doubles have varied careers and surprising specialties, making them truly indispensable on the set. 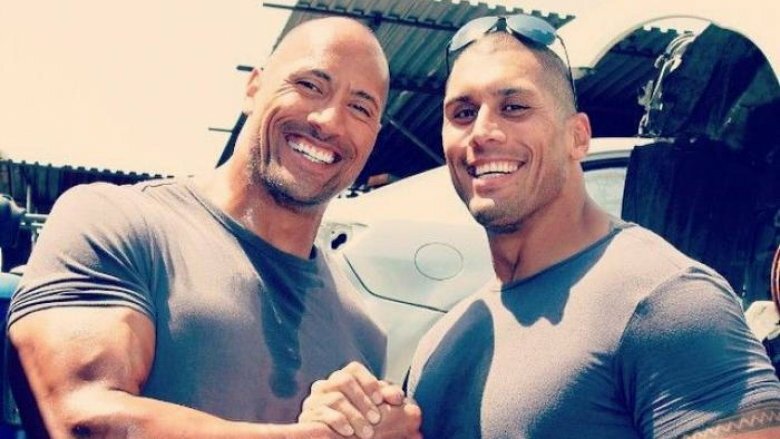 Get ready to rub your eyes in disbelief, because we're taking a look at actors who look freakishly similar to their stunt doubles. Tom Hardy has been charming audiences for years, from Mad Max: Fury Road to Venom. But years before he played the symbiote-sporting reporter Eddie Brock in the latter film, Hardy took on a very different comics-inspired role: the Batman villain Bane in Christopher Nolan's The Dark Knight Rises. As Bane, Hardy had to bulk up, go bald, and wear a rather uncomfortable-looking mask. And of course, he needed a stalwart stunt double to take on the more dangerous acts of villainy. Decked out alongside Hardy was Buster Reeves, a man with dozens of stunt credits to his name, including serving as Christian Bale's double in Batman Begins and The Dark Knight. While their faces might not be a perfect match, in costume, it is very hard to tell the two apart — their shaved heads are even the same shape. If you look closely, you might also notice him playing the role of "Joker's Thug #2" in The Dark Knight — a role for which he was unfortunately uncredited. The daughter of actor-director Ron Howard, Bryce Dallas Howard is a major talent in her own right. In the Jurassic World franchise, she portrays the savvy, slick, fashionable, and ambitious Claire Dearing. And while Jurassic World eschewed many of the practical effects of its 1993 predecessor Jurassic Park, instead favoring computer-generated dinos, there was still plenty of stunt work to be done. Enter Whitney Coleman, no stranger to working with powerful actors to enhance their characters. In addition to big box office blockbusters, Coleman has compiled a great deal of TV stunt credits on shows like Westworld, Fear the Walking Dead, True Detective, and Grey's Anatomy. While we expect that Howard tackled the precarious job of running in high heels (no mean feat! ), Coleman was the right person to fill her shoes when the stakes were raised. 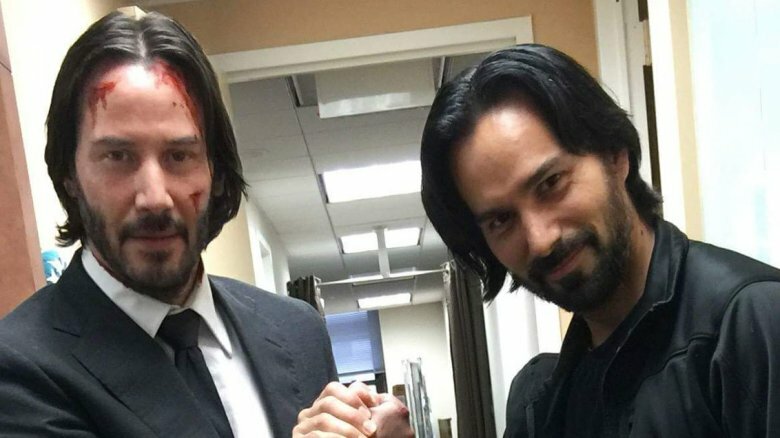 Keanu Reeves is, without a doubt, one of the most distinct faces in Hollywood, to the point that one might assume it would be hard to find someone who looks exactly like him — yet his double for John Wick, Mack Kuhr, is an impressively close match. Kuhr got his start modeling in college, and he actually has more acting credits than stunt credits, including roles on Jessica Jones, Gossip Girl, Ugly Betty, and Law and Order: Special Victims Unit. Even in John Wick, he not only acted as Reeves' double, but as "Sniper #1." While Reeves is living in Hollywood, Kuhr has decided to tackle acting in the Big Apple — and with his hair and beard grown out, one has to wonder how many times Kuhr is confused for Reeves while strolling through Central Park or taking the MTA. Mark Ruffalo has a truly diverse list of movie genres under his acting belt, though many fans can't help but think of him as the charming, sensitive movie boyfriend in fluffy romcoms. Roles like Bruce Banner/The Hulk in The Avengers have allowed him to bring together that delightful addle-headed soft-boy persona with a great deal of action and adventure. When Ruffalo needs to get rough, Anthony Molinari is often brought in. 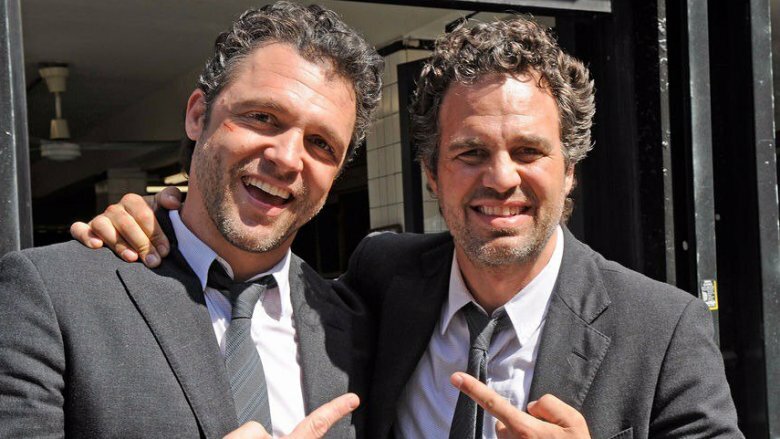 He's stunted for Ruffalo on a number of occasions, including Now You See Me (and its sequel), Just Like Heaven, and Reservation Road. 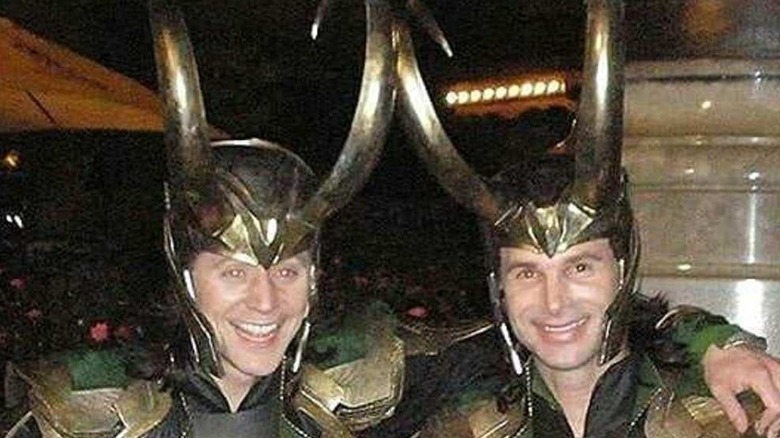 He's also doubled for Avengers co-star Jeremy Renner, and Hollywood heavyweight George Clooney, just to name a couple. But it seems Molinari has really taken to the Marvel Cinematic Universe, as he also signed on to play a S.H.I.E.L.D. agent in 2019's Captain Marvel movie — and as an actor in his own right, not a stunt double. Chris Pratt has risen to the upper ranks of modern comedy action heroes with his roles in the Marvel Cinematic Universe and the Jurassic World series, preceded by his run on the cult classic sitcom Parks and Recreation. Funny and handsome, Pratt is the kind of everyman that audiences can really root for. But no star can perform all the heroics himself, so stunt double Tony McFarr has been brought on to shoulder the load for Pratt — both as Star-Lord in the MCU and Owen Grady in the Jurassic franchise, as well as doubling for Pratt in the sci-fi drama Passengers. 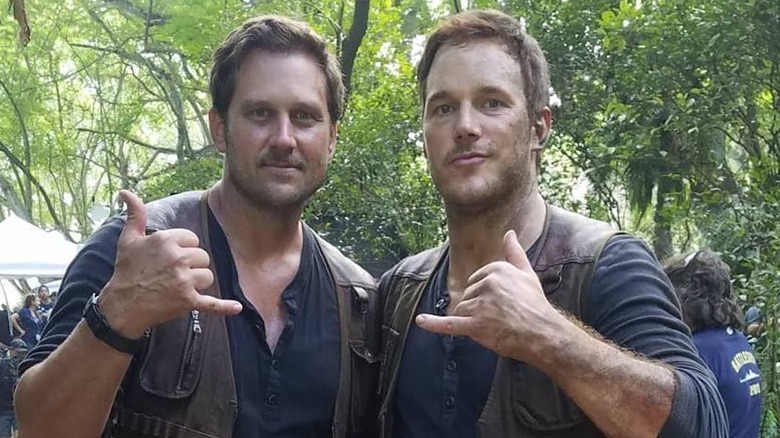 Whether he's grooving through space or wrangling raptors, McFarr has got Pratt's look down pat, making the two difficult to distinguish without a stunt double-take. Another actor known for her action and her wit, Uma Thurman is the heart and soul of films like Quentin Tarantino's Kill Bill and Pulp Fiction. Though we'd all love to imagine the vengeful Bride performing all those myriad deeds of badassery herself, the complex martial arts and fight sequences really called for a professional. Zoë Bell, who got her start as Lucy Lawless' stunt double on the Xena television series, was just the woman for the job. Also an actor, Bell has flexed her muscles in fan favorites like Iron Man 3 and Thor: Ragnarok (as a double for Cate Blanchett), as well as another Tarantino hit, Inglourious Basterds. It's hard not to love a two-woman team bringing a lot of power to some of the most beloved roles in film. And while separately they are very clearly distinct people, the similarities when placed side by side are difficult not to notice. From the wrestling ring to The Fast and the Furious, Dwayne "The Rock" Johnson is nothing if not an action-packed powerhouse of a man. While surely he's strong enough to attempt some feats of bravado himself, there are tasks only a stunt double can perform. So where do you find a double with the build and charisma of the Samoan strongman? You hire his cousin, Tanoai Reed. 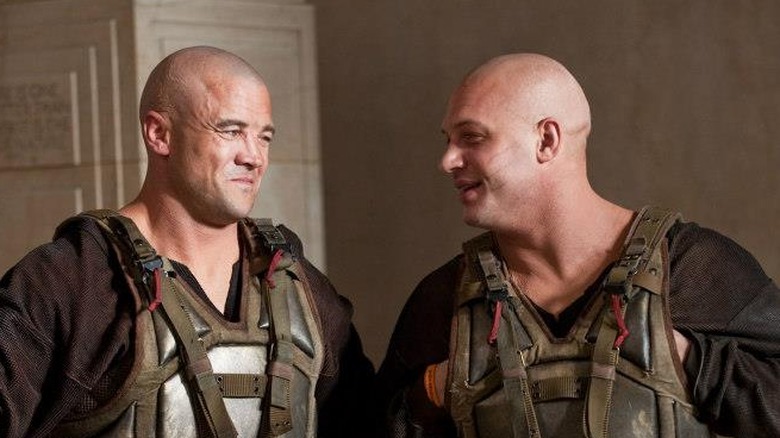 While Reed has pursued plenty of his own roles in both stunt work and acting, he's also Johnson's personal stunt double, working alongside his cousin in all of his projects. It's no secret that the Rock is serious about family; he talks about his relationship with his mother often, and was able to buy her a new house. He even became a wrestler to follow in his father's footsteps. It should come as no surprise, then, that he's incorporated his family-first mentality into his working life. And it seems that he likes to give gifts, as he gifted Reed with a brand new truck in 2018. Like the Rock, Arnold Schwarzenegger is a difficult man to duplicate. With a background in bodybuilding, an extensive acting career, and a second life spent in politics, he certainly seems to have taken to the role of being both man and machine. 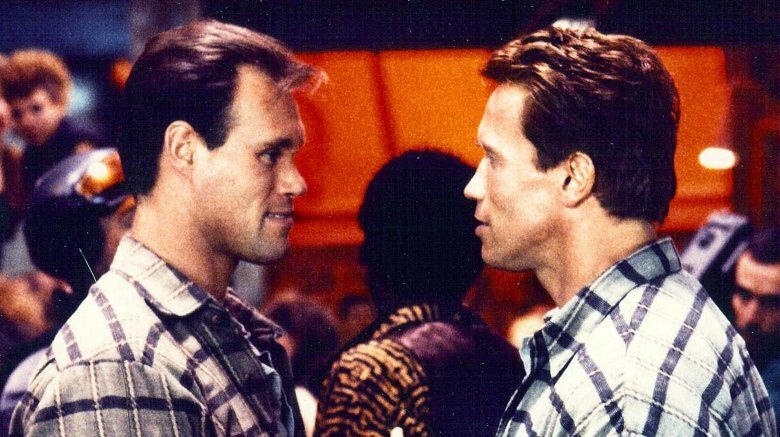 In 1984, he was introduced to Peter Kent, who was to be his stunt double for James Cameron's sci-fi classic The Terminator. Kent would continue to work with Schwarzenegger over the course of 14 films, and his website bio says that in the span of that time he was also Schwarzenegger's "friend, workout partner, ski buddy, confidant, chef and dialogue coach." What are the chances that two men who bear similar physical characteristics would also get along so well off the set? Kent went on to create and host a behind-the-scenes stunt reality series called Stuntdawgs, and has also done a good deal of screenwriting in addition to his stunt work. There are some actors who seem to have been born to play the villain's role — or at the very least, the role of the anti-hero. Tom Hiddleston is one excellent actor audiences love to see being bad, as evidenced by his popularity as the Marvel Cinematic Universe's Loki, the not-so-good brother to Thor. With his impish features and exquisitely honed acting skills, he's the whole dastardly package. Playing a supervillain means being involved in some dangerous plots, so stuntman Paul Lacovara was brought on starting in 2014 with The Avengers. Outside of the MCU, he's doubled for Hiddleston on Kong: Skull Island. In fact, Lacovara seems to have a penchant for comic book roles, as he's had both acting and stunt work in projects like The Runaways, Fear the Walking Dead, Supergirl, and Agents of S.H.I.E.L.D. Tom Hardy: the man so dashing he's on this list twice. And somehow, despite his impressive features, that means he's had two stunt doubles who really fit the bill as would-be twins. In 2015, Hardy played the title role in George Miller's post-apocalyptic extravaganza, Mad Max: Fury Road — a film with an incredible number of stunts, ranging from falls to explosions, trick motorbike riding, and flaming guitar solos. Hanging off a moving tanker is not for amateurs, and stuntman Jacob Tomuri was enlisted to help keep the audience's blood pumping during the many near-death antics in the film. Tomuri is used to doing stunts that are epic in scope, as he cut his risk-taking teeth on the Lord of the Rings film trilogy. Since Mad Max, he's worked with Hardy on Legend, The Revenant, and Venom. Tomuri took part in many press interviews with Hardy following Mad Max, giving viewers an interesting new perspective on the filmmaking process. 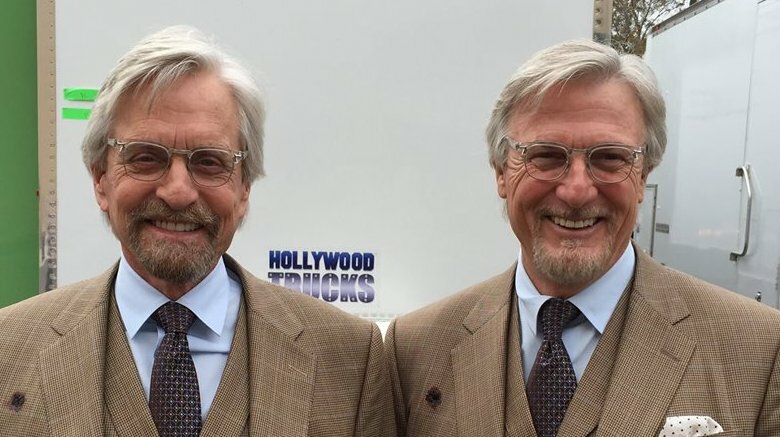 Hollywood veteran Michael Douglas, recently seen in theaters as Hank Pym in the Ant-Man movies, has been working with his stunt double Mike Runyard for just about 30 years now. The two have grown understandably close in that time, eventually becoming golfing buddies. They say you start to look more and more like the person you hang out with the most, don't they? (And it's even more fitting that these two even have the same first name.) In addition to playing Pym, the pair have worked together on such diverse roles as Detective Nick Curran in Basic Instinct, Liberace in Behind the Candelabra, and Madec in Beyond the Reach, just to name a few. Runyard has also worked as a stunt driver, stunt rigger, and stunt coordinator. With more than 150 stunt credits to his name, it's fair to say that he's as illustrious a stuntman as Douglas is an actor. 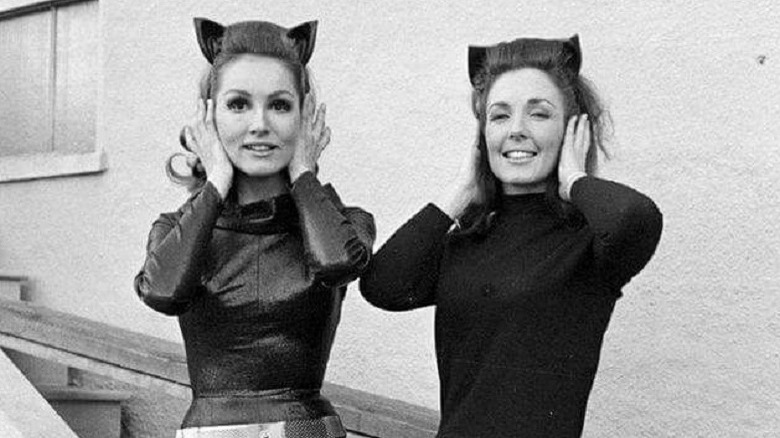 Julie Newmar's name is nearly synonymous with glamour. She has a history of ballet and stage performance, but is perhaps best known for her 1960s portrayal of that most sensual of famous femmes fatale, Catwoman. Many incredible actors have taken on the mantle of the cat, but Newmar's performance was the litmus test for all that came after. And even though the Batman series of the '60s lives on in our collective memory as the goofy origins of the much darker Dark Knight today, there were plenty of practical stunts that needed doing. Newmar's double was a lovely woman by the name of Marilyn Watson, and though it's nearly impossible to find any personal information about her, it's easy to see that she has just as much allure as Newmar herself. One can imagine the two of them lounging around backstage smoking cigarettes and exchanging cat-eyed makeup tips.